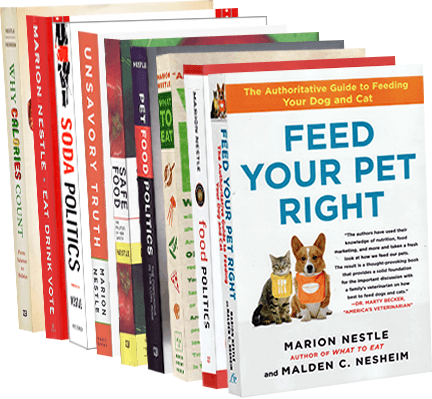 Food Politics by Marion Nestle » USDA issues rules for competitive school foods. Yes! At long last the USDA released Interim Final Rules for competitive foods—the snacks and sodas sold from vending machines and carts outside of federally supported school lunches. Snacks to be rich in whole grains, have real food as a first ingredient, and provide nutritional value. Drinking water to be available to all students at no cost. Other drinks to contain no more than 40 calories per 8 fl oz, or 60 calories per 12 fl oz. This excludes all regular sodas, even Gatorade. Competitive foods have long been a bone of contention. They compete for kids’ food money with the school meals. Although USDA regulates where and when they can be sold, schools routinely violate such rules. I’ve seen for myself how many schools allow vending machines to be open during lunch periods. 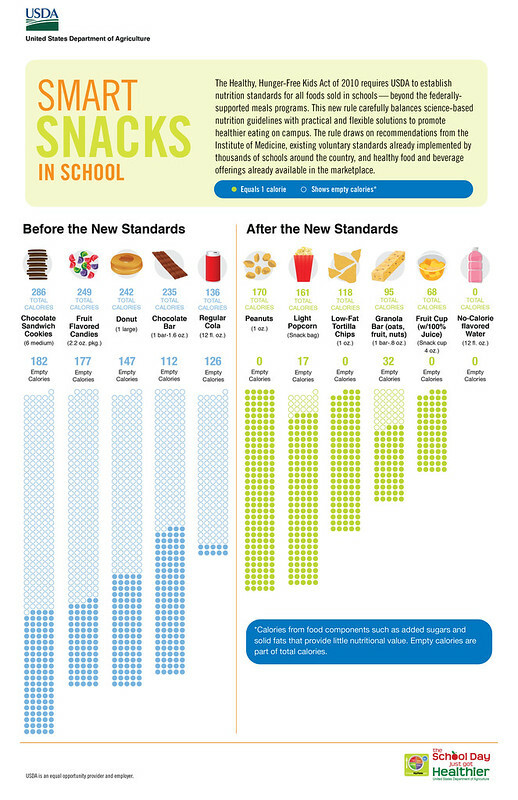 The USDA issued nutrition standards for school meals early in 2012, but it’s taken this long to issue the ones for competitive foods, no doubt because of the expected uproar from food and drink producers whose products will now be excluded. To back up the rules, the USDA has produced a vast array of materials and documents. A separate web page links to all of the legislative and other documents, videos, issue briefs, Q and A’s, statement from First Lady Michele Obama, and other items of technical assistance to the new “smart snacks in schools” program and rules. The thank you note from Margo Wootan of Center for Science in the Public Interest who has worked to achieve these standards for years. The infographic from the Kids’ Safe and Healthful Foods Project, a collaboration between the Pew Charitable Trusts and the Robert Wood Johnson Foundation . But note: the rule is “interim” because the 120-day comment period is now open. USDA can still make plenty of changes. Schools will have a year to implement the final standards. You think there won’t be opposition? Think again. The Government Accountability Office (GAO) has just released a report recommending that USDA ease off on restricting the amount of meat and grains allowed in the school meal standards that went into effect this year. Apparently, USDA agrees. GAO reports are usually requested by members of Congress and this one is no exception. Guess which party these particular requesters belong to, and who funds their election campaigns. USDA deserves much applause and support for its courage in issuing rules for competitive foods that might actually help kids stay healthier.